AMSTERDAM – The first recommendations from a rheumatology society for managing patients with Sjögren’s syndrome are nearing finalization by a EULAR task force, and they divide the treatment targets into sicca syndrome and systemic manifestations of the disease. 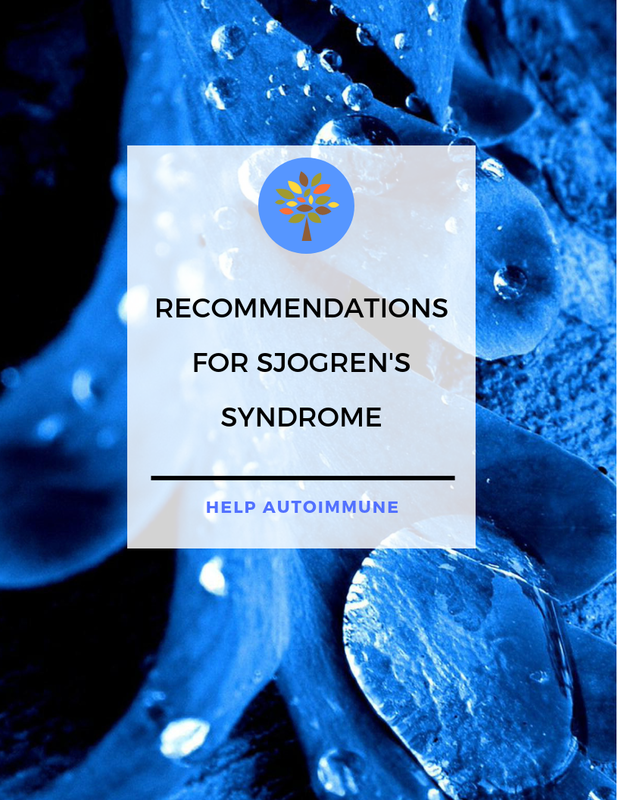 “In Sjögren’s, we always have two subtypes of patients: those who have sicca syndrome only, and those with sicca syndrome plus systemic disease,” explained Soledad Retamozo, MD, who presented the current version of the recommendations at the European Congress of Rheumatology. “We wanted to highlight that there are two types of patients,” said Dr. Retamozo, a rheumatologist at the University of Córdoba (Argentina). “It’s hard to treat patients with sicca syndrome plus fatigue and pain because there is no high-level evidence on how to do this; all we have is expert opinion,” Dr. Retamozo said in an interview. • Patients with Sjögren’s should be managed at a center of expertise using a multidisciplinary approach, which she said should include ophthalmologists and dentists to help address the mouth and ocular manifestations of sicca syndrome. • Patients with sicca syndrome should receive symptomatic relief with topical treatments. • Systemic treatments – glucocorticoids, immunosuppressants, and biologicals – can be considered for patients with active systemic disease. The statement’s specific recommendations start with managing oral dryness, an intervention that should begin by measuring salivary gland (SG) dysfunction. The document next recommends nonpharmacologic interventions for mild SG dysfunction, pharmacological stimulation for moderate SG dysfunction, and a saliva substitute for severe SG dysfunction. All three recommendations are evidence based, relying on results from either randomized trials or controlled studies. The second target for topical treatments is ocular dryness, which starts with artificial tears, or ocular gels or ointments, recommendations based on randomized trials. Refractory or severe ocular dryness should receive eye drops that contain a nonsteroidal anti-inflammatory drug or a glucocorticoid, based on controlled study results, or autologous serum eye drops, a strategy tested in a randomized trial. 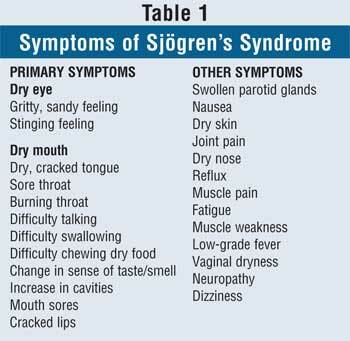 The recommendations then shift to dealing with systemic manifestations, starting with fatigue and pain, offering the expert recommendation to evaluate the contribution of comorbid diseases and assess their severity with tools such as the Eular Sjögren’s Syndrome Patient-Reported Index (ESSPRI) (Ann Rheum Dis. 2011 June;70:968-72), the Profile of Fatigue, and the Brief Pain Inventory. Using evidence from randomized trials, the recommendations tell clinicians to consider treatment with analgesics or pain-modifying agents for musculoskeletal pain by weighing the potential benefits and adverse effects from this treatment. For other forms of systemic disease, the recommendations offer the expert opinion to tailor treatment to the organ-specific severity using the ESSPRI definitions. If using glucocorticoids to treat systemic disease, they should be given at the minimum effective dose and for the shortest period of time needed to control active systemic disease, a recommendation based on retrospective or descriptive studies. Expert opinion called for using immunosuppressive treatments as glucocorticoid-sparing options for systemic disease, and this recommendation added that no particular immunosuppressive agent stands out as best compared with all available agents. In more than 95% of reported cases of systemic disease treatment in Sjögren’s patients, clinicians used the immunosuppressive drugs in association with glucocorticoids, Dr. Retamozo noted. Finally, for systemic disease the recommendations cited evidence from controlled studies that B-cell targeted therapies, such as rituximab (Rituxan) and belimumab (Benlysta), may be considered in patients with severe, refractory systemic disease. An additional expert opinion was that the systemic, organ-specific approach should sequence treatments by using glucocorticoids first, followed by immunosuppressants, and finally biological drugs. The recommendations finish with an entry that treatment of B-cell lymphoma be individualized based on the specific histopathologic subtype involved and the level of disease extension, an approach based on results from retrospective or descriptive studies. The recommendations must still undergo final EULAR review and endorsement, with publication on track to occur before the end of 2018, Dr. Retamozo said.